Reserve a new static external IP address and then assign the address to a new VM instance. Promote an existing ephemeral external IP address to become a static external IP address. If you require a static IP address on your internal Compute Engine network, read Reserving a Static Internal Address instead. In Compute Engine, each VM instance can have multiple network interfaces. Each interface can have both internal and external IP addresses. Forwarding rules can have external IP addresses for external load balancing or internal addresses for internal load balancing. To learn about IP addresses, read the IP Addresses documentation. A static external IP address is an external IP address that is reserved for your project until you decide to release it. If you have an IP address that your customers or users rely on to access your service, you can reserve that IP address so that only your project can use it. It is also possible to promote an ephemeral external IP address to a static external IP address. A regional IP address which can be used by VM instances with one or more network interfaces or by Network load balancers. A global IP address which can be used for global load balancers: HTTP(S), SSL proxy, and TCP proxy. Reserve a static external IP address in the gcloud command-line tool or through the API. After reserving the address, assign it to an instance during instance creation or to an existing instance. Only one resource at a time can use a static external IP address. There is no way to tell whether an IP address is static or ephemeral after it has been assigned to a resource, except to compare the IP address against the list of static external IP addresses reserved to that project. Use the addresses list sub-command to see a list of static external IP addresses available to the project. Each VM instance can have multiple network interfaces, but each interface can have only one external IP address that is either ephemeral or static. Note: Network interfaces can receive traffic from multiple forwarding rules, which might serve other external IP addresses. Any number of external IP addresses can reference a network interface through these forwarding rules, but each network interface can have only one external IP address that translates packets to the interface's internal IP address. For more information about load balancing and forwarding rules, read the load balancing documentation. Choose a name for the new address. Specify whether this is an IPv4 or IPv6 address. IPv6 addresses can only be global and can only be used with global HTTP(S), SSL proxy, and TCP proxy load balancers. Choose whether this IP address is regional or global. If you are reserving a static IP address for an instance or for a Network load balancer, choose Regional. If you are reserving a static IP address for an HTTP(S), SSL proxy, or TCP proxy load balancer, choose Global. If this is a regional IP address, select the region to create the address in. [Optional] Select a resource to attach the IP. [ADDRESS_NAME] is the name you want to call this address. If you are specifying a regional IP address, provide the desired [REGION] for the request. This should be the same region as the resource you want to attach the IP address to. If it is a global IP address, specify the --global flag. If you want an IPv6 address, specify both --global and --ip-version IPV6 flags. IPv6 addresses can only be global and can only be used with global HTTP(S), SSL proxy, and TCP proxy load balancers. [REGION] is the name of the region for this request. When you create a VM instance, it is automatically assigned an ephemeral external IP address. If you don't want an ephemeral external IP address, you can explicitly assign a static external IP address to the instance instead. Note: Before you can assign a static IP address, you must first reserve the static external IP address. Under Network interfaces, click on the default network interface to edit it. Under the External IP section, select the static external IP address that you reserved from the drop-down menu. Click Done to finish modifying the default network interface. [IP_ADDRESS] is the IP address to assign to the instance. Use the IP address, not the address name. You can change or assign an external IP address, either ephemeral or static, to an existing instance by modifying the instance's access configuration. An instance can have multiple interfaces and each interface can have an external IP address. If the instance already has an external IP address, you must remove that address first by deleting the old access configuration. Then, you can add a new access configuration with the new external IP address. Note: It is not possible to change the external IP address of a forwarding rule. If you need to update the IP address of a forwarding rule, unassign the current IP address and delete and recreate the forwarding rule with the desired IP address. Click the name of the instance that you want to assign an external IP to. The instance details page displays. Under Network interfaces, click the edit button. Under External IP, select either an ephemeral or static external IP address to assign to the instance. [Optional] Reserve a static external IP address. If you want to assign a static external IP address, you must reserve an address and make sure the address is not currently in use by another resource. If necessary, follow the instructions to reserve a new static external IP address or to unassign a static external IP address. If you intend to use an ephemeral external IP address, you can skip this step, and Compute Engine will randomly assign an ephemeral external IP address. Note: The name of your access config might be different than external-nat; make sure to check for your own access config name. In some cases, an older version of the access config name, External NAT, might be used. [ACCESS_CONFIG_NAME] is the access config to delete. Make sure to include the full name between quotes. Add the new external IP address. Note: Don't replace [IP_ADDRESS] with the name of the static IP. You must use the actual IP address. [ACCESS_CONFIG_NAME] is name to call this access config. Make sure to include the full name between quotes. [IP_ADDRESS] is the IP address to add. If your instance has an ephemeral external IP address and you want to permanently assign the IP to your project, promote the ephemeral external IP address to a static external IP address. 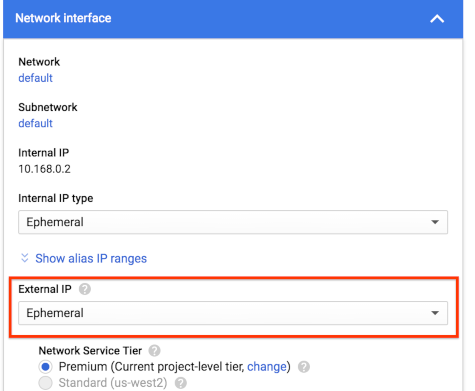 Promoting an ephemeral external IP address to reserved does not cause GCP to drop packets sent to the instance. This includes packets sent to the instance directly or by means of a load balancer. In the Type column, change the address type to Static for the IP address you want to promote. Provide a name for the new static IP address and click Reserve. [IP_ADDRESS] is the IP address you want to promote. [REGION] is the region the IP address belongs to. The external IP address remains attached to the instance even after it is been promoted to a static external IP address. If you need to assign the newly-promoted static external IP address to another resource, unassign the static external IP address from the existing instance. To list static external IP addresses that you have reserved for your project, run addresses list or make a GET request to the API. Go to the External IP addresses page in the GCP Console to see a list of IP addresses for your project. To get information about a static external IP address, use the gcloud compute addresses describe command and provide the name of the address, or make a GET request to the API. Click the IP address you want to get more information about. where [ADDRESS_NAME] is the name of the external IP address you want to describe. [ADDRESS_NAME] is the name of the IP address. You can unassign a static external IP address by deleting the instance or deleting the access config attached to the instance that is using the address. Unassigning a static external IP address allows you to reassign the static external IP address to another resource. In this example, example-address-new is currently in use. where [INSTANCE_NAME] is the name of the instance. Note: Keep in mind that if an instance does not have an access config, it will not be able to access the Internet. [ACCESS_CONFIG_NAME] is the name of the access config to delete. Make sure to include the full name between quotes. Check that your static external IP address is now available and marked as RESERVED instead of IN_USE. Now that your static external IP address is available, you can choose to assign it to another instance. If you no longer need a static external IP address, you can release the address so that it is returned to the general IP pool for other Compute Engine users. Note: You can only release a static IP address if it is not being used by another resource. Optionally, you can choose a specific internal IP address to assign to an instance when you create it. The IP address must be a valid IP address of the subnet of the instance, and the IP address must not already be in use. The IP address remains attached to the instance until you delete the instance, which releases the IP address back into the pool. If you stop and restart the instance, the instance retains the same internal IP address. If you do not specify an IP address, Compute Engine automatically allocates one from the subnet or network. You can specify an internal IP address using the gcloud command-line tool or the API. [INSTANCE_NAME] is the name of the instance you want to create. [IP_ADDRESS] is the IP address you want to assign. If you are using a custom subnet mode network, you must also specify the subnet using the --subnet [SUBNET] parameter. [IP_ADDRESS] is the IP address to assign to the instance. If you delete an instance with a specified IP address, the address goes back into the unallocated address pool. If you need an internal IP address to persist beyond the life of the instance, you can reserve a static internal IP address. For certain workloads, you might have essential requirements that include security and network restrictions. For example, you might want to restrict external IP address access on VM instances to prevent data exfiltration or maintain network isolation, all of which are common and necessary restrictions for many customers. 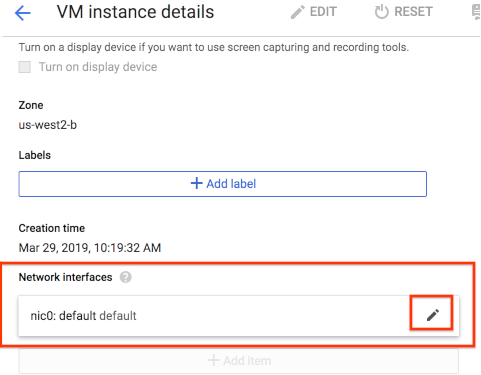 Using an Organization Policy, you can now disable external IP access with a policy constraint that makes it easy and convenient for you to control external IP address access for your VM instances within an organization or a project. To use the constraint, you specify a policy with an allowedList of VM instances that can have external IP addresses. If no policy is specified, all external IP addresses are allowed for all VM instances. When the policy is in place, only the VM instances that are listed in the allowedValues list can be assigned an external IP address, either ephemeral or static, and other Compute Engine VM instances in the organization or project that are not explicitly defined in the policy are prohibited from using external IP addresses. You can only apply this list constraint to VM instances. You cannot apply the constraint retroactively. All VM instances that have external IP addresses before the policy is enabled will keep their external IP address. This constraint accepts either an allowedList or a deniedList but not both in the same policy. It is up to the you or an administrator with the right permissions to manage and maintain the instance lifecycle and integrity. The constraint only verifies the instance's URL, and it does not prevent the white listed VMs from being altered, deleted, or recreated. To set a constraint on either the project or the organization level, you must have been granted the orgpolicy.policyAdmin role on the organization. To set a constraint for external IP access, you first need your organization ID. Select an organization and look for the organization ID. Note: The max length of each string used for each VM instance URL cannot exceed 200 characters. Go to the Organizational Policies page. If necessary, choose the desired organization from the project dropdown menu. Click Define Allowed External IPs for VM instances. Click Edit to edit the external IP policy. If you can't access the Edit tool, you do not have the correct permissions. Select Customize to set specific the org policy for specific VM instances. Choose the desired Policy enforcement and Policy type. Under Policy values, select Custom. Enter a partial URL to a VM instance and hit enter. Continue entering VM instances as desired. [PROJECT_ID] is the project ID for this request, such as example-project. Note that this is different than setting up organization policies, which require the organization numeric ID. [ZONE] is the zone of the instance. Alternatively, you can specify a deniedValues list to express VM instances that you explicitly want to prohibit from having an external IP address. Any instance not on the list would implicitly be allowed to have an external IP address. You can only specify either allowedValues or deniedValues but not both. where [ORGANIZATION_ID] is the numeric ID of the organization. Use the setOrgPolicy() API to define your constraint. The VMs in the allowedValue list you specify will be allowed to have external IP addresses. Alternatively, you can specify a deniedValues list to express VM instances that you explicitly want to prohibit from having an external IP address. Any instance not on the list would implicitly be allowed to have an external IP address. You can only specify either allowedValues or deniedValues but not both. Setting a policy at the project level overrides the policy at the organization level. For example, if the organization level has example-vm-1 on the allowedValues list but the policy at the project level has the same VM on the deniedValues list, the VM instance would not be allowed to have an external IP addresses. Follow the same process documented under Setting a policy constraint on the organization level but choose your desired project from the project selector instead of the organization. Alternatively, you can specify a deniedValues list of VM instances that you explicitly want to prohibit from having an external IP address. Any instance not on the list would implicitly be allowed to have an external IP address. You can only specify either allowedValues or deniedValues but not both. Use the setOrgPolicy() API to define your constraint. The VMs in the allowedValue list you specify will be allowed to have external IP addresses. Alternatively, you can specify a deniedValues list to express VM instances that you explicitly want to prohibit from having an external IP address. Any instance not on the list is implicitly allowed to have an external IP address. You can only specify either allowedValues or deniedValues but not both. where [PROJECT_ID] is the project ID for this request. Google recommends that you avoid using the deniedValues list with this constraint. If you define values in the deniedValues list, it means only the VM instances in the deniedValues list are restricted from using external IP addresses. This could be a security concern if you want control over exactly which instances can have external IP addresses. If you want to remove certain instances from the allowedValues list, update the existing policy to remove the instances from the allowedList rather than putting the instances into the deniedValues list at a lower hierarchy. If you want to set a policy over a large part of the resource hierarchy but exempt certain projects, you should restore the default policy using the setOrgPolicy method by specifying the restoreDefault object to allow all VMs in the projects to be associated with external IP addresses. The policies currently in place for projects will not be affected by this default setting. Use this org policy together with IAM roles to better control your environment. This policy only applies to VM instances but if you want to better control and restrict external IP addresses on network devices, you can grant the compute.networkAdmin role to the appropriate parties. Any services and products that are running on Compute Engine within the organization or project with the policy enabled are subject to this org policy. Specifically, services such as Kubernetes Engine, Dataflow, Data Proc, and Cloud SQL are affected by this policy. If this is an issue, Google recommends setting up other services and products in a different project that does not have the organization policy applied, and use Cross-Project Networking if needed. Learn more about networks and firewalls. Learn how to address VM instances using internal DNS.